IndieCade is a festival that highlights independent games and up-and-coming developers. At IndieCade's booth on the E3 show floor, I walked past a slew of interesting, unique games, but I didn't have time to try them all; I had to pick carefully before it was time to rush off to the next appointment. As I circled the booth, Infinitap Games' Matt Gilgenbach approached me in front of a demo station for his Kickstarted game Neverending Nightmares. As I was drawn in by the game's creepy, distinct art style, Gilgenbach told me it was inspired by his struggles with mental illness, and I knew I had to try it. In Neverending Nightmares, you take the role of a young man named Thomas who keeps waking up in his bedroom from a series of ever-more-disturbing dreams. "I want to capture the fear, anxiety, uncertainty, and horror that I've faced in my own experience and channel it into the game," Gilgenbach told me in an email after the convention. 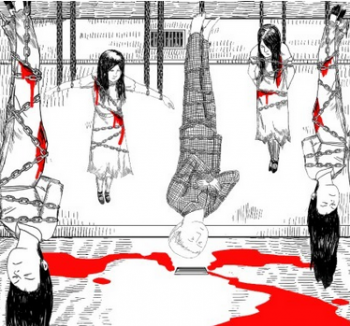 He finds it "tough to communicate what struggling with those issues is like to others," and Neverending Nightmares is his way of doing just that. In addition to my show floor demo, I've played through the entire alpha build of the game in the safety of my own home, in daylight hours, with the lights on--and still found myself yelping and shouting "Nope!" at some of the creepier moments. I won't reveal too much of the game's story, as that's something that's best explored without knowing much ahead of time, but Neverending Nightmares has a minimal approach to horror, managing to be genuinely scary (at least to this scaredy-cat) without being gimmicky. There's no combat in the traditional sense, but Thomas will find himself in danger quite a bit, and it's up to you to successfully navigate the environments while being aware of his vulnerabilities. Outside of his bedroom where he keeps waking up, the setting, a 19th-century mansion, continues to deteriorate and transform as the player goes deeper and deeper into the nightmares--a sort of demented Inception. This sense of hesitant-but-curious exploration was reminiscent of other games with scary undertones, like Maniac Mansion, The 7th Guest, and Gone Home--but it's really nothing like those games, particularly when it comes to art style. The "black-and-white pen-sketch look reminiscent of Edward Gorey" makes every room even more menacing, even when there's no one else in it. There are splashes of color here and there--some blood on the wall, objects to be interacted with--but most of the game is black and white, with the dark always ominously creeping up on you. "The art style is created by hand drawn objects and backgrounds in conjunction with a shader based lighting system," Gilgenbach told me. "We use the position of the light sources and shadows in the scene to calculate animated pen sketch shading to the scene." Additionally, the use of creepy music and sound effects heightens the horror effect; it's recommended at the beginning of the game that the player use headphones to experience it. Acording to Gilgenbach, "One of the main themes in Neverending Nightmares... is disempowerment. If your protagonist has muscles on top of muscles and a rocket-propelled grenade launcher, it's going to be difficult to create something scary." Instead, the gameplay is simple, with three real controls: walk, run, and interact. Interacting could mean opening doors, hiding in cabinets, or picking up and using objects; most of the game will be spent carefully walking as the environments grow more and more disturbing, though occasionally you'll have to sprint out of danger. You can't run for too long, though, because like Gilgenbach, Thomas has asthma; after a few seconds, he'll stop to catch his breath, leaving the player helpless. "If you can barely run 20 feet without having to stop to catch your breath, you are going to feel very vulnerable, and it's much easier to create effective horror," Gilgenbach said. "I've found that not being able to breathe is quite terrifying, so I am hoping to capture that in the game." Based on the moments in the alpha build where I was rendered hopelessly out of breath as an enemy drew closer, I'd say that this approach was successful. What I also found successful was how Gilgenbach managed to relate the terrible aspects of OCD through gameplay. Gilgenbach suffers from intrusive thoughts, which are "terribly unpleasant images that your mind comes up with in order to upset you." People with OCD can't just shrug off these images; "once they get in your head, they are difficult to get out." Haunted by thoughts of self-harm for over a decade, Gilgenbach put these images directly into the game, including one particularly disturbing scene that the player experiences in first-person. The alpha build, which Kickstarter backers and slacker backers can download now, has five nightmare levels, with a sixth being planned for Neverending Nightmares' official release in September. There are also plans for a "branching storyline," with Infinitap Games working to add more branches before launch. The $15 title will be available for Ouya, Windows, Mac, and Linux; the alpha build is currently my favorite Ouya game. As a serious anxiety sufferer, I know how hard it is to talk about mental illness, let alone deal with the stigma attached to it. On the show floor, Gilgenbach and I discussed this, and he told me how people treated his asthma as a real disease and depression as something he should just get over; I've often been told to "relax" or "calm down," as if it were that simple. Trying to remove the stigma of mental illness and relate these experiences through an independent video game is no small task, and I can't help but appreciate Gilgenbach's efforts. 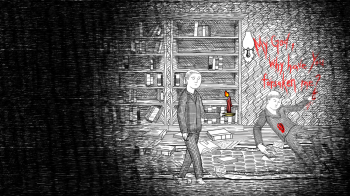 From what I've played, Neverending Nightmares is a great game in its own right, but with its message about mental illness, it's just outstanding. I very much look forward to playing the completed build later this year--with the lights on, of course.